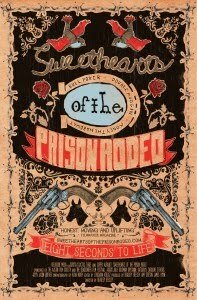 Coming soon to a theater, university, video store or correctional facility near you: Sweethearts of the Prison Rodeo , documentary filmmaker Brad Beesley's fascinating group portrait of feisty female convicts who are relative newcomers -- but determined competitors -- in a decades-old statewide event previously restricted to male inmates in the Oklahoma prison system. After earning rave reviews and audience acclaim at various international festivals, the film will kick off what its distributor bills as "a Western Swing tour" Sept. 17 in Manhattan and Austin, and screen in various other venues (including the Southern New Mexico Correctional Facility) prior to its Oct. 25 DVD release . Beesley chatted with me for a Cowboys & Indians Q&A I did last year -- you can read all about it here. You can check out the screening schedule here, and view my brief video interview with Beesley and producer James Payne here. And you can read my original Variety review of the documentary here. Labels: "Sweethearts of the Prison Rodeo"